#172) Circle the White House, Make Yourself Heard! What would you do if 10,000 people circled your house? Obama clearly heard their message. 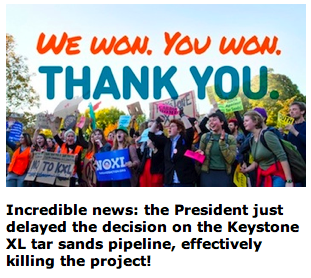 Four days after the big Tar Sands Pipeline protest, the State Department announced they will look for a different route for the pipeline through the U.S. — postponing the issue until after 2012. Who says protests don’t work?